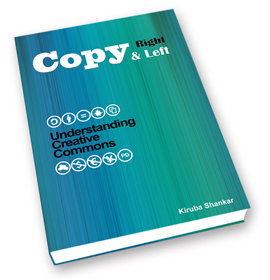 This book can be proudly called as one of the very first books in the subject of Creative Commons in India. It is like a beginner's guide to Creative Commons giving an insight to CC licenses and their usage and advantages. Now what is Creative Commons? Creative Commons helps the creators to retain their copyright while allowing others to copy, distribute, and make some uses of their work. Read More.. Looking for Indian Examples of Creative Commons Usages. Can One Make Money In-spite of CC licensing? The “No Rights Reserved” Alternative to CC licenses. How to Get to the Venue!